Downloading a good astronomy app puts a personal astronomer in your pocket. The latest versions of the SkySafari app for iOS and Android include short audio tours of hundreds of constellations, major stars, planets and deep-sky objects — all geared toward non-experts. And with the app's extensive suite of pronunciation audio clips, you'll know the correct way to say their names. This article was provided by Simulation Curriculum, the leader in space science curriculum software and the makers of the SkySafari app for Android and iOS. For skywatchers, the most memorable star parties are the ones where an experienced astronomer was there to trace out constellations and tell the stories behind them. Perhaps he or she identified the planets and bright stars, told viewers how to pronounce the more exotic-sounding names, and explained the science around them. The astronomer took the time to share with others the special features of each celestial object shown through the telescope. In this edition of Mobile Astronomy, I'll tell you how to download a free astronomy app for your mobile device that puts a personal astronomer in your pocket. That way, you can summon your virtual expert any time you are out under the stars. The free iOS version features an inexpensive ($3.99) in-app purchase that unlocks a package of extras called the Cosmos Collection. The package adds audio tours for hundreds of objects and audio pronunciations for even more. Orbit Mode allows you to travel to other planets, moons and stars. Galaxy View lets you visualize the 3D positions of stars and deep-sky objects in the Milky Way. Let's take a look at the way each of these features puts a personal astronomer in your device. 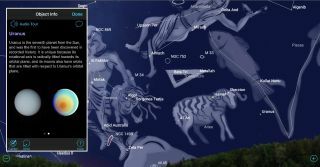 Most astronomy apps include written content about celestial objects, but even a few moments of looking at your device's display will spoil your eyes' dark adaptation on a clear dark night. The problem can be reduced by lowering your device's screen brightness to a minimum and by switching on the app's Night Vision mode, which turns the screen content red. (Dim red light will not interfere with the dim-light receptor cells in your eyes.) Another drawback to reading is that you can't be observing the object in the sky, or through your telescope or binoculars, at the same time. Audio content avoids that problem. The Cosmos Collection provides in-depth audio tours for 400 celestial objects — a total of 4 hours of content. Depending on the object type, different information is provided. For example, each constellation tour covers some mythology, the target's relationship to other constellations, and what time of year it is best seen. Planet tours emphasize their discovery and interesting facts and figures about their internal structures, atmosphere and weather, and any moons that orbit them. The audio tours for stars tell you where they were mentioned in historical writings, what part they play in forming their constellation, their visual appearance, their distance from Earth, and other fascinating stellar science details, such as their mass and luminosity compared with our sun. For example, the tour for Deneb, the brightest star in Cygnus the Swan, points out that it is one of three stars that form the famous Summer Triangle asterism. The tours for deep-sky objects — the nebulas and star clusters that form the Milky Way, plus the many distant galaxies located millions of light-years away from the sun — are especially helpful when using binoculars or a telescope. Each tour describes what you will see when using telescopes of various sizes. The physical size and distance to each object is covered. And the audio tour helps to highlight some of the characteristics that a beginner might miss when observing the object. After you select an object in SkySafari Basic, tapping the Selection icon in the toolbar opens a list of functions to apply to it. The Object Info, Pronounce Object and Audio Tour options tell you more about the object, while Orbit Object flies you into space to see it up close and Galaxy View shows you where it is located in relation to the sun and the Milky Way. To access an audio tour in SkySafari, select an object by tapping it on your device's display, selecting its entry in one of the Search Menu lists, or by typing the name into the search bar. Once an object has been selected, tap the Selection icon in the on-screen toolbar. This opens a list of actions for the object. Tap the Audio Tour icon to listen. Tours can also be accessed using the speaker icon at the top left corner of each objects' Info page. If there is no tour available, the icon is grayed out. The Cosmos Collection audio tours allow a group of skywatchers to share in the experience. Or, pop in your earbuds and explore the universe by yourself. This is probably a good idea when you are observing near other astronomers. Audio tours will abruptly stop if your device goes to sleep. The Plus and Pro versions of SkySafari have a setting to prevent the app from sleeping. For basic version users, change your device's auto-lock setting to prevent it from sleeping. Another benefit of having experienced astronomers along for your night under the stars is that they can tell you how to pronounce the names of constellations and starsthat might be unfamiliar to you — or how to correctly say the name of our solar system's seventh planet. I always chuckle when a youngster (usually of the male gender) tries to trick me into saying Uranus. They are always disappointed when I say "Yoor-a-nus," and not "Your-ay-nus." The constellation Camelopardalis, in the northern sky near the Big and Little Dippers, has a tongue-twisting name derived from the Greek words for camel and leopard. Although the name means giraffe, the constellation is generally considered to represent a camel. For example, the northerly constellation of Monoceros translates to Unicorn. When pronounced correctly, it sounds like rhinoceros. Another tongue-twisting constellation is Camelopardalis. The name comes from the Greek roots: kamēlos ("camel") and pardalis ("leopard"). The combined word means giraffe, although the constellation is actually a camel — the one that Rebecca and Isaac rode in a Bible story. The app tells us to pronounce it "Ca-mel-o-pard-a-lis". The naked-eye star sitting just below Jupiter this summer is named Zubenelgenubi, derived from the Arabic phrase "al-zuban al-janubiyy," which means "southern claw." (It used to be part of the constellation Scorpius.) Once you learn to pronounce it properly, it rolls right off the tongue! To hear the pronunciation for an object, select it, then tap the Selection icon, and then tap the bubble-shaped pronunciation icon. You can also use the pronunciation icon displayed at the upper right corner of the object's Info page. As with the Audio Tours, the icon will be grayed-out if no pronunciation is available. Alternate pronunciations are provided, too. Where in the galaxy is that? Galaxy view is another feature new to the SkySafari basic version that was long available to Plus and Pro users. With this tool, your pocket astronomer can show you where each object is located with respect to the sun and our galaxy. After selecting an object, open the Selection Menu and tap the Galaxy View icon. The app will display a graphical representation of our galaxy in both top-down and edge-on views that show where the object is situated in the Milky Way. Our sun's position is noted, too. The display can be pinched and zoomed to see a detailed view, or choose Auto zoom to see an optimized enlargement. The SkySafari app's Galaxy View icon shows you a representation of where in space a celestial object is located. The globular cluster designated Messier 13 (left panel) is one of dozens of such objects that orbit just outside the Milky Way, like bees around a hive. The Andromeda Galaxy, also known as Messier 31, is 2.5 million light-years from the sun, and sits below the plane of our galaxy, as shown at lower right. A submenu, indicated by three dots at the lower right of the Galaxy View display, lets you center the view on the sun or the object, display labels on our galaxy's spiral arms, and draw sectors that illustrate which parts of our galaxy are covered by the major constellations. As an alternate to the astronomer in your pocket, the Cosmos Collection's Orbit feature turns you into a starship captain. When you use Orbit mode, the app lifts you off Earth and takes you to other planets, moons and stars, and even comets and asteroids. Once in orbit around the object, you can pan and zoom the display to look around, flow time forward and backward to see how things move over time, and view 3D objects from any angle. You can also use the app's Search function to find objects and view them from your new location in space. The distance from the object is noted at the top of the display, and up and down arrow icons at lower right allow you to venture closer or farther from it. Tapping the Orbit icon for a selected object lifts you off Earth and puts you into space alongside the object, where you can alter your distance from it and roll your device's display around to view the object and the surrounding space from different angles. This screen capture shows comet c/2016 M1 (PanSTARRS) on its way into the inner solar system. Note the comet's tail extending faintly to the lower right, away from the sun. You can open the time controls and flow time forward to ride along with the comet as it rounds the sun. Open Search Menu / Brightest Comets and select a comet (for instance, comet C/2016 M1 PanSTARRS is currently traversing the inner solar system). Tap the Orbit icon and you'll take up a position in space beside it. Scroll the display around and position the sun and inner planets in the center of the display (beyond the comet). Now open the time controls, tap the Hour value to set that as our time-step increment, and flow time forward by tapping the right-hand arrow. Now you are journeying with the comet as it flies through the solar system. If the sun drifts out of view, just pan back to it. Orbiting distant stars can give you a sense of the volume of space we exist in. As an example, search for the primary star of the colored double-star Albireo (also known as Beta Cygni 1) and tap the Orbit icon. Once there, use Search to find its blue partner Beta Cygni 2 and tap the Center icon. When you increase the distance from Albireo to more than 50 light-years, you can see both stars and pan around to see our sun in the distance. Tap the Earth icon to return home again. The SkySafari app renders in 3D the stars for which positions are known. This example shows Orbit View for the popular colored double-star Albireo in Cygnus. The primary yellow star has a nearby blue companion (at left). In this mode, you can view the pair from any angle and find the sun, shining in the distance. SkySafari 6 and the Cosmos Collection for Android devices are expected to be released later this year. After spending some time listening to tours and hearing the pronunciations, you will be ready to act as the astronomer the next time you join friends or family under the stars. Or, if you're shy, just pull out your device and turn up the volume. In future editions of Mobile Astronomy, we'll look at spotting satellites, the upcoming Mars close opposition, how we measure the distances to stars, and how their gradual drift in position will one day change our familiar constellations. In the meantime, keep looking up!